We provide high quality health care services to women of all ages in a sensitive and supportive manner. Dr. Ana M. Tamayo is dedicated to your well being, from annual preventive exams, to gynecologist consultations, to outpatient surgery. Our practice focuses on: Preventive Gynecologic Care, Gynecologic Surgery, Family Planning, Infertility Treatments and Consultations for a variety of female reproductive health care. Get in touch with us immediately to schedule a same day consultation. Feel comfortable in a pleasant environment from the waiting to the consultation room. Dr. Tamayo performs major outpatient surgeries in Memorial Hospitals. Option to access your lab results online through our patient portal. 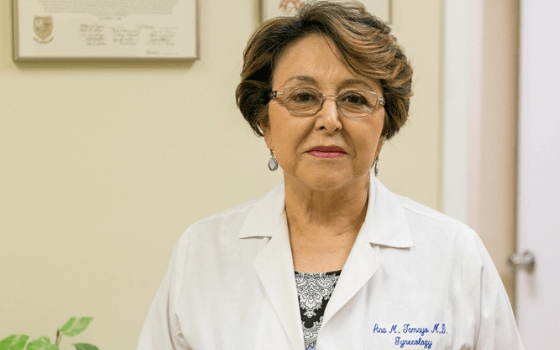 Dr. Tamayo has privileges in the Memorial Hospitals in south Broward, where she performs major gynecological surgery, minimally invasive procedures and outpatient surgery since 1982. Currently, Dr. Tamayo does not provide prenatal care and obstetrics. Our practice is located on University Drive, between Sheridan Street and Stirling Road. Click on the link below to get directions to our office. Local gynecologist in the area of Pembroke Pines, Davie, Plantation, Cooper City, Miramar and Hollywood. Consultations and second opinions for your gynecologic conditions, including hospital in and outpatient surgery. We accept most of Medicare Advantage programs. If your insurance is not listed, please call us for assistance. We no longer do obstetrics services such as deliveries. Tell us what date and time works best for you and we will call you back to confirm the appointment. Gynecology and gynecologic surgery for women of all ages. Our gynecology practice is located in Pembroke Pines, Florida. Local gynecologist in the area of Pembroke Pines, Davie, Plantation, Cooper City, Miramar and Hollywood.